If your skin is rough and dry there are products on the market that you can use to rectify this issue. Moisturizing body lotion is an effective remedy that will improve the appearance and condition of all the skin on your body. The best moisturizing body lotion contains natural ingredients that absorb quickly and don’t leave a greasy, uncomfortable feeling. Our pick, Hempz Original Herbal Body Moisturizer, contains 100% natural Hemp Seed Oil for exceptional hydration. There are tons of body lotions available to choose from these days. With so many types and choices available, it can be overwhelming to figure out which products are quality and which should be passed over. In this buyer’s guide, you will find information that is designed to help make your research and decision-making process much easier. There are several things you want to consider before purchasing a moisturizing body lotion. Keep reading below to learn what those are and how to sort through the countless choices available to you so you can pick the right one for your needs. 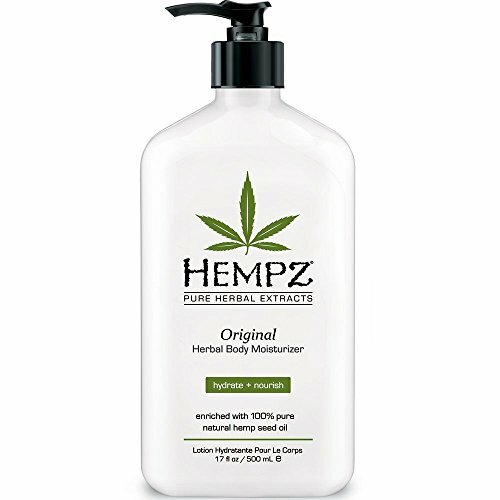 Hempz Original Herbal Body Moisturizer is a well-known product that has been enriched with 100% natural Hemp Seed Oil. This body lotion is 100% Vegan, gluten-free, THC-free, and contains no parabens. Its soothing Shea Butter and Ginseng will calm the skin and provide hydration that the skin needs, especially in winter months. Other important ingredients include Vitamins C, A and E that work to protect the skin from environmental and natural triggers that can cause it to become dry, cracked and uncomfortable. Your skin will look smooth, nourished and healthy. The large 17-ounce bottle has a convenient pump top for easy application. Apply it a few times a day, or as needed, so the healing can begin. The healthy, nourished skin you’ll generate from using this quality product will look and feel great. 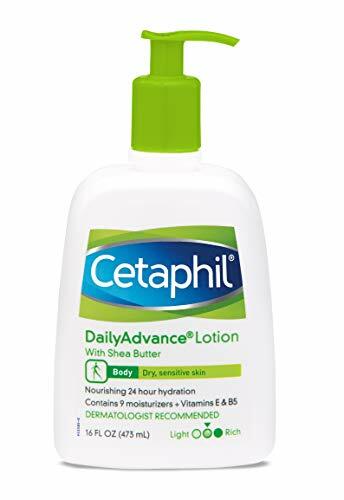 Cetaphil is a well-known brand of moisturizing body lotion. This lotion is meant to be used every day and works to intensely moisturizing and hydrate dry skin. Those with sensitive skin can use this lotion with excellent results. The hydration provided by the application of the lotion acts fast to start hydrating the skin and provides those benefits all day long. It is fragrance free and safe to use all over the body. With all of the pollutants and factors in the environment that can rob the skin of important moisture, it’s crucial to have a body lotion that can stand up to the task of fighting those irritants. Cetaphil gets to work quickly and is safe for even the most sensitive, dry skin. There are five key ingredients in Cetaphil that make it the great lotion it is, one of which is Shea Butter. The other ingredients are less familiar to most people and include Sodium PCA, Sodium Panthenol, Dimethiconol and Cycolpentasiloxane. Combining these 5 ingredients creates a hydrating and protecting lotion that can reverse drying and cracking and leave skin healthy and beautiful. CeraVe is a fast-absorbing lotion that will restore your protective skin barrier, moisturizing it and providing the restoration you want. This lotion was developed with dermatologists’ input and is non-irritating and non-comedogenic as well. It is made with ceramides that soften and moisturize the skin as well as help it retain that moisture. One of the unique features of CeraVe is the MVE technology that gradually releases protective ingredients into the skin throughout the day which nourishes and moisturizes it all day long. CeraVe gets deep into the skin to restore essential lipids and skin balance without feeling heavy, sticky, or greasy. It has no fragrance to irritate the skin and can be used by those with sensitive skin too. One of the most inexpensive ways you can give your skin the nutrients and pampering it needs is by regularly applying a moisturizing body lotion. There are hundreds of lotions on the market that can help improve the skin. A moisturizing body lotion adds important moisture to skin all over the body. However, it isn’t typically used on the face since there are specific moisturizers designed for facial skin. There are many ingredients that are often present in a high-quality body lotion including Shea Butter, Vitamin E, and many others. With all of the choices available, you want to be careful when you choose one for your dry skin needs. Cheap, no-name lotions are not going to be beneficial to your dry skin and can be considered a waste of money. Your skin is exposed to several threats on a regular basis including dust, over exposure to heat, harmful chemicals, and more. Keeping it moisturized and healthy is an important step in keeping it youthful looking and fresh. There are several things you want to consider before you purchase a moisturizing body lotion. These factors will help you choose the right lotion for all of your moisturizing needs. Is your skin bumpy or flaky? – Look for lotions that offer exfoliating properties so you can remove dead skin cells and smooth your skin. Exfoliating body lotions are good for treating what is known as chicken skin. This skin usually appears on the back of the thighs and arms and is bumpy in appearance and texture. Degree of dryness – If your skin is just slightly dry, a regular, daily-use body lotion should be all you need. If it is extremely dry, including dry patches, cracked skin on the heels or other issues associated with severely dry skin, opt for the most emollient, rich moisturizing lotion you can find. Babies can use regular lotion too – Babies can often get very dry, flaky skin due to the immaturity of their skin. Find a body lotion that is dye-free, gentle, and fragrance-free and be sure it contains no harsh chemicals. These can even be better than traditional baby lotion. Avoid Firming lotions and Stretch Mark Creams – Despite the huge product industry that tries to sell consumers on products that claim otherwise, experts state that there is no lotion you can use to get rid of problems like cellulite. The way to get rid of cellulite is through diet and exercise – not a special skin lotion. Don’t go too cheap or too expensive – There are some great products on the market designed to heal and improve the condition of dry skin. Avoid super cheap lotions as they tend to contain a lot of chemicals and very little that will help your dry skin. Super expensive lotions are not necessarily the best either. The best course of action is to look for the moisturizing body lotion that contains the healthy all-natural ingredients you want without the added chemicals, parabens and fragrances you want to avoid. Use lotion after showering on damp skin – Using body lotion on skin that is slightly damp helps the humectants in the lotion absorb into your skin. It also allows the occlusives to become sealed in where they can really help. No matter what type of lotion you choose, applying it to damp skin will reap better results. There is a large selection of body lotion on the market. Once you have determined what your specific needs are you can better choose the lotion that is right for you. We listed many of the common lotion types below with some characteristics of each. Maintaining the Skin – This is a basic body lotion that is often available in dry, normal, and oily formulas. This lotion’s purpose is to keep the skin soft. Damage Repair – This lotion has a rich, creamy texture that is designed to treat highly sensitive, severely dry skin, regardless of skin type. Depending on the brand, this damage repair lotion can also be available in different formulas for different skin types. Anti-Aging/Anti-Wrinkle – This body lotion is specifically made for older, more mature skin. It often has anti-oxidants, vitamin E, retinol and other all natural ingredients that are designed to reverse the signs of aging. Many have vitamin C which is widely thought of as a miracle vitamin for skin. There are several things you want to look for when you start researching different lotions that are available on the market. Humectants – These include ingredients such as hyaluronic acid, glycerin and panthenol. These are all hydrating ingredients that will draw moisture to the skin’s outermost layer. Remember that applying to damp skin helps the humectants absorb into the skin quicker. Emollients – These can be ingredients such as cyclomethicone and dimethicone and others like jojoba oil and glyceryl stearate. The purpose of the emollients is to fill in the gaps that are present between cell clusters, this makes the skin feel super smooth and soft. No Fragrances/No Dyes – Both fragrances and dyes can irritate the skin, especially if it is sensitive. The best body lotions for the skin are those that state they are fragrance and dye free. Affordable Price – Since body lotion is applied all over the body daily, you want the price to be reasonable because you will be purchasing it often. Some brands offer multi packs where you can purchase two or three bottles for a lower price. There are also subscription services for some brands that can automatically ship the lotions once a month or so. These are good options to lower the price and find a lotion that fits your budget as well as your skin’s needs. Long Lasting Moisture – Many of the lotions on the market, including the three top-rated choices we have featured here, have moisturizing properties that last all day long and not just for a short time. Packaging – Look for bottles that have pump tops or tubes. This prevents bacteria from getting into the moisturizer and contaminating it. Jars can be virtual Petri dishes and usually have a lot of bacteria due to unclean fingers being dipped into the jar. Occlusive Ingredients – These are ingredients such as petrolatum, lanolin, mineral oil and wax. While these ingredients do create a barrier over the skin, many people can be allergic to them, especially babies. It is better to find all-natural choices and avoid the heavy, chemical-based brands that have been shown to cause skin reactions and irritations. Skin goes through a lot over the course of several days or weeks, including exposure to extreme heat or cold, exposure to excessively dry air in the wintertime, sun exposure and much more. Finding the right moisturizing body lotion can help protect your skin from these factors and others. The younger you are when you start taking care of your skin the less repair work you will need to do to counteract future problems. Make sure you know you skin type before purchasing a body lotion. This will help you choose the body lotion that will repair and heal your issues without adding to them. There are so many choices on the market that it is guaranteed that you can find one that will be perfect for your own needs. If the top-rated moisturizing body lotions we featured above do not work for you, use all the information you learned from reading the buyer’s guide to sort through additional choices. Finding the right product will not be difficult now that you understand what goes into a high-quality lotion and what you should look for when researching and shopping.